I am a fan of subtle patterns. For any background patterns, Subtle patterns is my go to site. These beautiful background patterns and textures simply add to the personality of the website. Light patterns, paper textures, stripes, fabric feel… “Subtle Patterns” covers it all. When I am working on a new design project or perhaps plan to refine the look of my own websites, I go and check out the backgrounds on Subtle Patterns and pick the one that just works! But for setting it as site background, I have to download the pattern, upload the background and then add a little CSS to make it work. Imagine if there’s something that allows me to preview all the subtle patterns live on my website and use the one I want. Voila! Genesis Subtle Patterns exactly does this. It allows you to preview the textures and patterns as site backgrounds and once you have made the choice, it’s as simple as saving the background and you have the new site background up an running in no time. 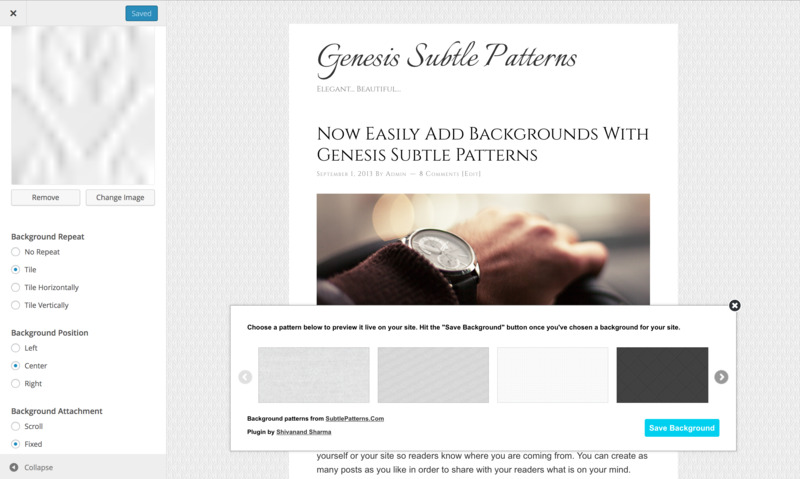 The Genesis Subtle Patterns features a pattern selector UI. When you activate the plugin, the pattern selector is activated on the front-end (and in WordPress customizer) of the site. You can browse through 200+ background patterns & textures and live preview the backgrounds for the site. Once you have chosen the background pattern, click on “Save Background” and the plugin will upload the background and define CSS for setting the background for your Genesis site. You can further customize the background using WordPress Customizer. You can fine-tune background properties like background-repeat, background-position and background-attachment through WordPress Customizer. Now, once you have saved the background and fine-tuned the background properties, you can simply go and disable the pattern selector. 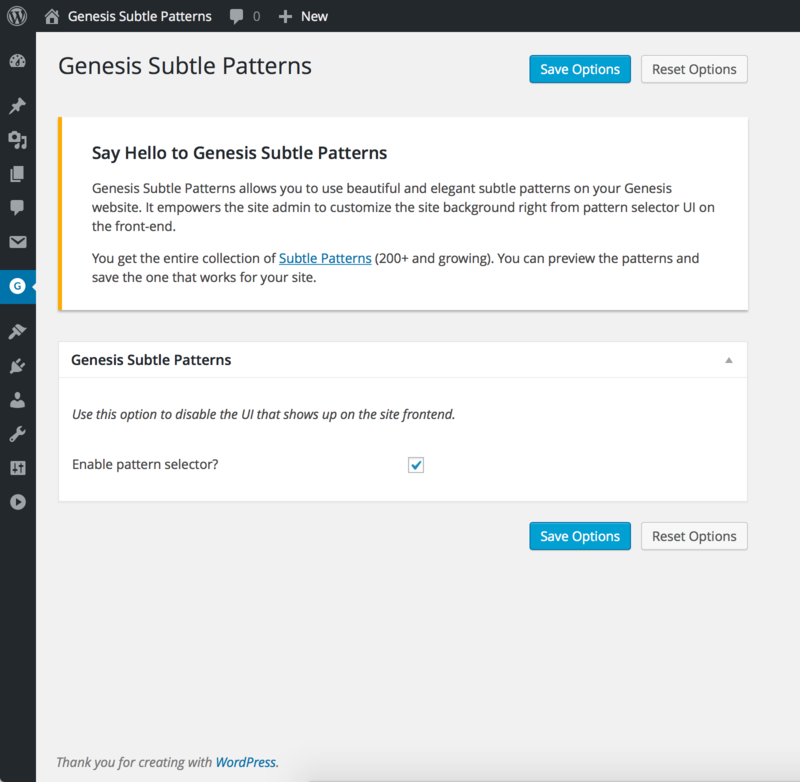 Go to Genesis > Subtle Patterns and uncheck “Enable pattern selector”. That’s neat and clean. What next? 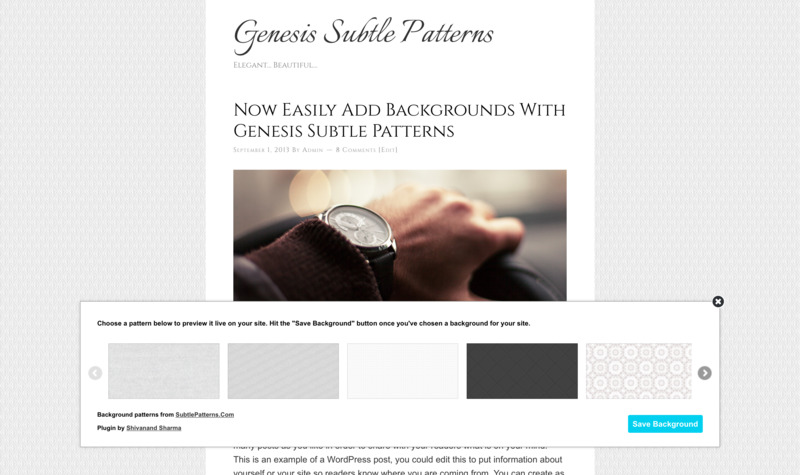 Download Genesis Subtle Patterns Plugin and set the subtle background patterns and textures for your site on the go.